NORTH BAY, Ont. – Ben Fanjoy and Nathan Todd each scored two goals as the Ottawa 67’s rolled to an 8-2 Ontario Hockey League victory Sunday over the North Bay Battalion, ending the Troops’ home winning streak at nine games. 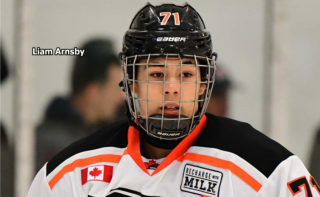 Jeremiah Addison, Artur Tyanulin and Austen Keating each had one goal and one assist and Sasha Chmelevski also scored for Ottawa, which improved its won-lost-extended record to 20-19-2 for 42 points, tied with the Peterborough Petes for second place in the East Division. Goaltender Leo Lazarev faced 34 shots for Ottawa, playing its third game since trading onetime captain Travis Konecny, the No. 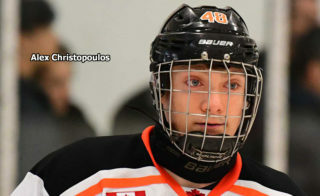 1 pick in the 2013 OHL Priority Selection. 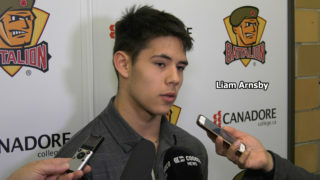 Mike Baird scored both Battalion goals as the Troops lost at Memorial Gardens for the first time since a 4-3 setback Nov. 19 to the Kingston Frontenacs. Starting goaltender Jake Smith allowed four goals on 15 shots in the first period before being relieved by Jake Kment, who also yielded four goals on 15 shots over the final 40 minutes before a crowd of 3,196. The Battalion, 8-3-1 in its last 12 games, is 20-15-4 for 44 points, fourth in the Central Division. Butler praised the effort of Baird, who returned from a three-game suspension. Fanjoy struck first, 2:24 into the game, finishing off a two-on-one rush, and Addison scored at 4:49, charging to the net and directing a Dante Salituro pass past Smith’s glove. Chmelevski, acquired in the Konecny trade, connected at 10:27, ripping a wrister into the top corner from deep in the right-wing circle, before Ottawa converted at 18:38 on its only power play of the period. Smith stopped Evan de Haan’s shot from the blue line but failed to handle the rebound, which Tyanulin shoved home. The Battalion’s best opportunity came in the last minute, when Lazarev sprawled to deny Zach Poirier. Lazarev also turned away good chances for Steve Harland, Cam Dineen and Max Kislinger. Baird replied at 2:16 of the second period. Harland wheeled right to left behind the net and flicked the puck across the crease, where Baird swatted it home at the right post. Brett McKenzie earned the second assist. 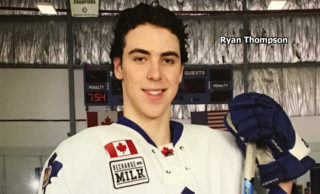 With the teams skating four a side, Todd made it 5-1 at 10:28 when he stationed himself in the slot and redirected Jacob Middleton’s lob shot from the blue line. The 67’s capped the period with three goals in a span of 2:57, starting at 15:05 when Keating scored on a pass from Connor Graham, who benefited from a blown icing call by linesman Pat Smith. Fanjoy was credited with a goal at 17:11 when his pass attempt glanced off the shaft of defender Mark Shoemaker’s stick, and Todd fired the puck over Kment’s right shoulder at 18:02. Baird scored on the power play at 6:24 of the third period when the rebound of a Kyle Wood shot went off Baird’s leg into the net. Mathew Santos had the other assist on Baird’s fifth goal of the season. The Battalion hosts the Sault Ste. Marie Greyhounds at 7 p.m. Thursday. BATTALION BULLETS: McKenzie has a five-game points streak during which he has three goals and two assists … Harland has an assist in each of the last five games … The Battalion went 1-for-6 on the power play. Ottawa was 1-for-4 … Opening lines featured Mike Amadio centring left winger David Sherman and right winger Santos, McKenzie centring left winger Baird and right winger Harland and Poirier centring left winger Jacob Ball and right winger Brett Hargrave. 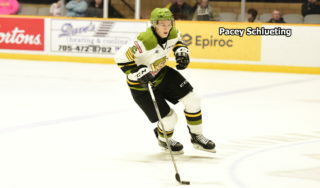 Kyle Potts pivoted left winger Kislinger and right winger Justin Brazeau … The Battalion dressed 19, one below the limit, scratching Zach Shankar, Riley Bruce and Daniil Vertiy, who suffered an upper-body injury in a 3-2 overtime loss Friday night to the host Sudbury Wolves … It was the second meeting between the Battalion and 67’s. The host Troops won 3-2 in overtime Oct. 29. North Bay visits Ottawa on Feb. 9, rescheduled from Nov. 8, and Feb. 15 … In a trade Wednesday with the Sarnia Sting, Ottawa acquired centre Chmelevski, right winger Chase Campbell and as many as 10 OHL Priority Selection picks for right winger Konecny, centre Sam Studnicka and a third-round choice. 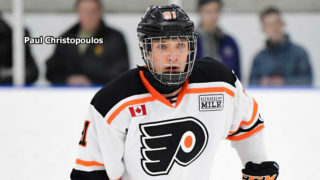 The 67’s received eight firm picks, namely three second-rounders, three thirds and two fifths, and two conditional second-rounders … Middleton replaced Konecny as captain.